Two Steps Forward.......Three Steps Back. 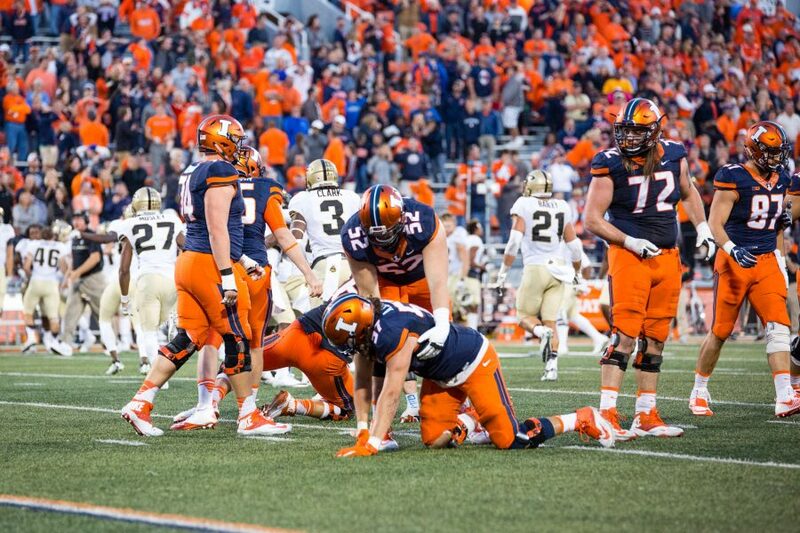 The rebuild of the Illinois football program continues as they drop a tough 34-31 loss in overtime to Purdue. Just when you thought that the Fighting Illini football team was poised to turn a corner, they do a complete reversal and leave you wondering. Case in point would be the debacle that was this past Saturday, where a Purdue team that had won just two conference games in coach Darrell Hazell's tenure in West Lafayette, came in and totally outplayed the Illini, en route to a 34-31 win in overtime. Illinois, who is still trying to find an identity for themselves, didn't make it any easier on them following the loss, which leaves more questions than answers at this point. Quarterback Wes Lunt left the game with an injury and backup Chayce Crouch was given control of the offense, and offered a new dynamic to the position in someone that can run and scramble. Lunt doesn't have any mobility, and perhaps Crouch presents the best option for offensive coordinator Garrick McGee's unit going forward. Crouch rushed 17 times for 137 yards and 2 touchdowns, and was effective through the air as well, completing 10 of 14 passes for 142 yards. Illinois (1-4, 0-2) had a chance to win the game at the end of regulation, but Chase McLaughlin missed a field goal, seeing the ball bounce off the crossbar, and in the first overtime period, Illinois fumbled on their opening possession, allowing Purdue to set up for the chip shot, a 28-yard attempt, by J. D. Dellinger to win the game and silence the crowd at Memorial Stadium. Illinois looks to snap a four game losing streak this coming Saturday when they travel to Piscataway, New Jersey to battle the Scarlet Knights of Rutgers at High Point Solutions Stadium (11:00 am CT, ESPNNEWS). Rutgers is coming off a pair of lopsided losses, the latter being a 78-0 pasting from Michigan last Saturday in Piscataway. The Scarlet Knights (2-4, 0-3) have not scored in two plus games, and have been outscored 136-0 in the last two contests. If ever there was a chance of getting a win, this would be the game to get that accomplished and regain a little bit of confidence that has been otherwise shuttered. Lose this game, and Illinois becomes one of the worst FBS programs this season and their prognosis for finding another win this season becomes increasingly more difficult. Last week, Illinois athletic director Josh Whitman unveiled a renovation plan for the south horseshoe and east sides of Memorial Stadium, a project that is slated to cost $132 million. Some of the highlights include seating that will extend to the field, allowing new weight and training facilities, coaches' offices, and meeting and meal spaces for the student-athletes. "For our student athletes to compete with other peer schools in the conference, we must get our facilities up-to-date so we can have the advantage in recruiting. Whitman was a former player for Illinois from 1997-2001 and has a passion for the football program in bringing it back to respectability. After an extended stretch of games away from Huff Hall that tested their mettle, the Fighting Illini womens' volleyball team have been playing much better as of late, and their only two setbacks have been to the #1 and #2 teams in the country. On Wednesday night, the Illini welcomed #14 Michigan State to town, and came away with a 3-0 sweep of the Spartans to improve their season record to 12-6 overall and 5-2 in the Big Ten. Illinois will continue their homestand this Saturday night when they welcome the Northwestern Wildcats (7:00 pm CT) for their only match of the weekend. The Illini womens' soccer team had a rough beginning to the Big Ten season, but in the last couple of games, have done better, coming away with a pair of wins. This past Thursday, Illinois defeated Michigan 3-0 in Champaign, and then on Sunday, Michigan State came to town, and the Illini won that game as well 3-1. Illinois, despite the two wins, is still a disappointing 5-9-1 overall and 2-4-1 in Big Ten play, and will take to the road this weekend as the regular season begins to wind down. The Illini will be in Lincoln, Nebraska on Thursday to take on Nebraska (7:00 pm CT), followed by a matinee on Sunday afternoon in Iowa City against the Iowa Hawkeyes (1:00 pm CT). With the calendar turning to October, Illinois held it's annual basketball media day for both the men and women this past Friday on the University of Illinois campus. John Groce, who begins his fifth season with the men, hopes that a healthy and veteran squad will be the recipe for a return to the NCAA Tournament, while on the women's side, coach Matt Bollant, who also begins his fifth season in Champaign, has turned over his roster and will rely on some young players to get his team elevated to the top echelon of the conference standings. A full preview of both teams will be featured in next week's blog entry. Jim is an avid sports fan, especially collegiate sports, and lives in St. Joseph, Illinois. He has been married to his lovely wife, Susan for 24 years this coming July, and is the proud father of three wonderful children, daughter Elena, who is 16, sons Austin, who is 12, and Caleb, who is 8. I am a freelancej writer in my spare time for both the Danville Commercial-News. as well as the St. Joseph Leader, with the occasional coverage with the Associated Press..